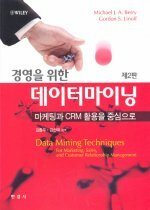 For any of our readers who have been wishing they could read our book Data Mining Techniques for Marketing, Sales, and Customer Relationship Management (2nd Edition) in Korean, now you can! We don't know why the cover pictures someone playing jacks, but then we don't really understand how our publisher chooses our U.S. cover pictures either. This book was already available in Japanese, and, of course, English. Earlier editions are available in Traditional Chinese and French.